Enjoy being on Ski Hill Road, close to Lutsen Mountains and Superior National at Lutsen Golf Course. Heritage B Hideaway is a private suite apartment located on the lower level of the Heritage B townhome. Enjoy a walk-out private patio and peek-a-boo views of Lake Superior. The Heritage Townhomes are 3 luxury townhomes located just off of Ski Hill Road in Lutsen, MN. Enjoy the king bed in your own private oasis in Lutsen. A private bathroom is just steps away. Seating for two next to the window where you can enjoy peek-a-boo Lake Superior views - better in the winter months. Curling up in front of the gas fireplace is a great place to relax on a cold winter night. Comfy leather seats are relaxing and inviting. No kitchen in the lower level suite, but you do have a nice wet bar to enjoy. The wet bar features an apartment size fridge, dishwasher, microwave, coffee pot, toaster, and sink. The beautiful tiled bathroom has a walk-in shower with seamless glass door. This suite features many luxurious details. The Heritage Townhomes are the area's premium luxury property, perched hillside near the base of Lutsen Mountains and only 20 minutes from Grand Marais. In addition, The Heritage Townhomes could not get much closer to the golf course as you are situated overlooking the River 9 at Superior National at Lutsen. It is a convenient location for skiing at Lutsen Mountains or participating in the Lutsen 99er Bike Race and the Norpine Fat Bike race. This cozy & private luxury suite "Hideaway" is located on the lower level of Unit B. It features a king bed, refrigerator with ice maker, convection/microwave oven, deluxe tile bathroom, gas fireplace, flat panel TV, and a walk out. Maximum occupancy is 2 people and it is a perfect retreat for a romantic getaway. You can't get much more centrally located than this in Lutsen! 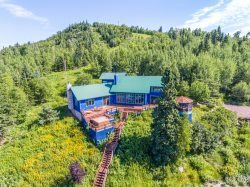 Located just off Ski Hill Road, you are half a mile away from the ski resort and summer recreation center including the Alpine Slide and sight-seeing Gondola. Papa Charlie's and Moguls Restaurants are near the mountain for full menu dining. There is a winery located right across Ski Hill Road (easy walking distance). Or head down toward Highway 61 and grab a bite to eat at the Lakeside Dining Room at Lutsen Resort or Lockport, both located within a mile. If adventure is what you seek, you've found it! The central location puts you right in the heart of hundreds of miles of hiking and mountain biking trails that weave back into the Superior National Forest. Plus you are just 10-20 miles away from many other dining and adventure options in Tofte, Lutsen, and Grand Marais. So whether you've come to relax or come to explore, Heritage Hideaway is a great location for your next North Shore vacation. Very nicely laid out. Great location. Hideaway B was very nice, clean, and updated. Bed was comfortable, bathroom was roomy. We did not appreciate not knowing ahead of time that there was NO Air Conditioning. Luckily it was a cooler week, had it been warmer I probably would not have booked the home at all. That is something that should be clearly warned to the resident ahead of time. The home was perfect for a kid free getaway and it had a view of the water, which we were pleasantly surprised by. Judging by the pictures on the website and google maps we thought we were going to be too far away to see the lake. Bonus that the winery opened up about 400 meters away. There were more amenities than we'd expected. I did not need to pack a hair dryer as recommended, but we would have appreciated more pillows. Nice home and location. Midway between Tofte and Grand Marais. Good hiking nearby. The Heritage B is a beautiful and romantic place to stay. We loved the location and the nice view of lake superior from our front door. The fireplace set the mood for our romantic evenings when we dined, even though the temperatures were unseasonably warm when we visited. We will definitely be renting a place from you again! We had a fantastic stay and a most memorable time celebrating our 10th anniversary. Thank you!